The new RIDGID 4-gal. 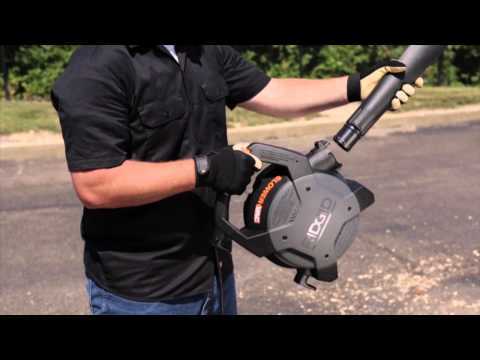 Wet/Dry Vacuum is a multi-functional tool that combines portable power and a handheld blower. This compact powerhouse packs a heavy-duty 6 peak horsepower rated motor to tackle even the messiest jobs. The power head of the vacuum detaches and quickly converts into a handheld blower with a locking wand that outperforms most dedicated leaf blowers. The quick-release cord wrap lets you spend less time unwrapping the 20 ft. cord and more time on the job. The caddy conveniently keeps your accessories and the hose close at hand. It is 2 incredible tools in one. 4 Gallon Detachable Wet/Dry Vac is rated 4.5 out of 5 by 210. Rated 4 out of 5 by Redcat43 from To early tell, but it looks like this unit will be a great addition to my household tools. I bought this wet/dry blower/vac online and picked it up at my local Home Depot store. It was well packaged and fairly easy to assemble. I used it a vacuum right away and it performed as well or better than my larger Craftsman a Shop Vac. Then I popped off the top and used it as a blower to blow the leaves out my garage and entryway. It is easy to pull around and the separate blower is a real plus. The whole unit is compact enough to easily park in my garage without taking up a lot of real estate. Rated 5 out of 5 by ReubenK from Great size for car cleaning and I like the detachable blower I had a 16 gal wet/dry vac with a detachable blower that I believe was made by Ridgid for Sears. The power and detachable blower were great but the size and the low profile made it unwieldy and it hurt my back to pick it up and get it through doors. Plus there were no bags that fit it. I used it for cleaning the car annually in the spring, leaf blowing in the fall which it was great for, and vacuuming water from heavy rains in basement. I got rid of it a year ago and wanted a 4 gal Ridgid with a detachable blower with similar power and kept looking online to see if one was made. Went to purchase a 4 gal vac a few weeks ago and found this one with the detachable blower. Love it. Size is great for storage and lugging up and down steps. Can get bags which makes clean-up much easier. Plus it worked great on the car cleaning especially with the accessory car cleaning kit. Would definitely recommend for homeowners who have intermittent small jobs like me and want to do car cleaning. The cord storage hook which turns and the storage compartment for attachments are also great. Disappointed it doesn't have a drain but with the small size it probably won't be an issue. Would have been nice if the amperage was on the box (10 AMPs) and in the manual so you can tell what gauge extension cord you need. Rated 3 out of 5 by Toolest from Very handy. This vacuum cleaner is a convenient size and is powerful enough. I bought a better hose, crevasse tool and brush tool. I would be more satisfied if the unit had come with better hose and tools. Rated 5 out of 5 by YourFace from Improvement to an already great wet/dry vac! I had the older version of this vac for years. Put it through the wringer. Always worked, always worked well. Gave mine to the FIL for something he needed and went to buy a new one when I noticed they have this snazzy new model with detachable blower. Probably my one single gripe on the old model and they went and fixed it! This vac is so far above the rest its not even close. If you need a vac, stop shopping, get this one and call it a day. Rated 5 out of 5 by Easydog from alot of vac in a small package. Using Vac.for plaster job, works great, lots of power, using bag, down side is the bags are a bit pricey, and doesn't come with one installed, but if you are using for plaster work, it's worth putting one in. $30.00 for two. check the hose in the box before you take it from store, mine was kinked. Hose is a bit stiff and easy to kink, but they are all like that, so which ever one you buy you may have that issue. Works great and very happy with purchase. Rated 5 out of 5 by Stevie from Must have We have used these at our horse ranch for years now. I now use it for the main house. It's perfect for my wood floors. Rated 5 out of 5 by Kayla from This product is a life saver! I love all the attachments and the suction power! It picks up everything. I like the different uses for each attachment. I can use for my car, The walls in the house, I can put the hose down my vents in my house and it cleans them out well, this is also very good for sucking up dog hair on hardwood floors.